Ever since the first edition of this book was published in 2001, it’s been a favorite of instructors and students because of the clear, concise way it teaches Java and OO programming. And this latest edition takes advantage of NetBeans to make it even easier for today’s students to learn core Java. You are currently on the Murach site for instructors. To buy this book, please visit our retail site. 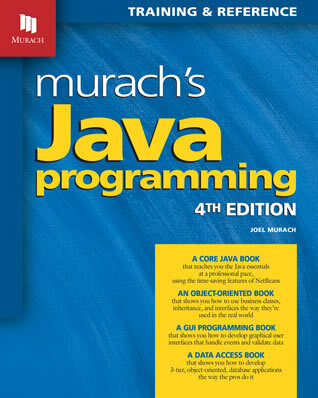 Murach’s Java Programming continues the Murach tradition of publishing only the best training books available." Ever since the first edition of this book was published in 2001, it’s been a favorite of instructors and students because of the clear, concise way it teaches Java and OO programming. Here are some of the details on how it works for your students. One warning before you start reading, though: This book doesn’t adhere to the ACM Curriculum for Computer Science courses...but it sure works great for all other Java courses. Your students will be writing their first complete Java applications at the end of chapter 2! By the end of chapter 5, your students will know how to use Java classes, objects, and methods to write bulletproof applications that use custom methods to validate user input. Starting from chapter 1, your students will take advantage of the time-saving features that an IDE provides as they use NetBeans to create, compile, run, test, and debug Java applications. Section 2, on object-oriented programming, cuts through the mystery of inheritance, polymorphism, and the factory pattern so your students can learn how to create and use sophisticated business and data access classes. At that point, your students will know how to develop real-world, object-oriented, business applications. In section 3, your students will learn more of the core Java skills that they’ll use all the time, like how to work with arrays, dates, strings, exceptions, enhanced for loops, try-with-resources, and more! Because each chapter in this section is independent of the others, you can teach these chapters in whatever sequence you prefer. Section 4 shows you how to use the popular Swing GUI Builder that comes with NetBeans to develop GUI applications. Here, your students will learn how to handle events, validate data, and populate objects to create applications that aren’t just useful, but easy-to-use as well. To complete their OOP training, section 5 shows how to write data access classes that store the data for objects in a file or database. Here, your students will learn how to: work with text, binary, and XML files; embed an Apache Derby database in an application; and use JDBC to work with any database. This book has always been a favorite with web developers who use Java servlets and JSPs. Now, this book is becoming a favorite with developers who are moving into Android programming. The short answer is: Just about everything. But here are four of the main ways our book differs from other Java books. Starting in chapter 1, it teaches how to use the time-saving features of the NetBeans IDE to develop Java programs, just as professional developers do. That helps the students learn faster. Then, right away in chapter 2, it presents a complete Java application that uses the Scanner class to get input data. That gives your students a starting subset of the language that they can build on. From that point on, all of the OOP concepts are presented in the context of Java applications. Above all, our book always uses business applications instead of "toy" applications, so OO concepts are never presented without real-world relevance. Along with the addition of NetBeans, there are new chapters on debugging and deployment in this edition. However, the Java and OOP skills that are taught are basically the same as in the SE 6 edition that was published in 2007, although all the material is updated to SE 7. So if you’ve been using this book in your introductory Java course, your basic outline will be very much the same. By the way, earlier editions had "Beginning" and the release number in the title. But we’ve dropped those because we’ve found they’re too limiting. This is a book that will follow your students into the workplace and serve them as an everyday reference there, no matter what release of Java they’re working with. This book teaches how to develop Java applications using the Java Platform Standard Edition (Java SE) and NetBeans, a popular, easy-to-use IDE. Although this book specifically covers Java SE 7, almost all of the core features will work with all previous releases of Java...and will continue to work with future releases as well. Your students can download Java and its documentation for free from the Oracle website. Likewise, they can download NetBeans for free from the NetBeans website. To make this easier, Appendix A (for Windows) and Appendix B (for the Mac) explain the procedures for downloading and installing both pieces of software. Can you use a different IDE with this book? Because this book shows how to use the NetBeans IDE to develop Java applications, that’s the easiest IDE to use while your students are learning. That’s why we recommend that you use NetBeans for this course. However, if you prefer to use Eclipse instead of NetBeans for your course, please let us know. We’ve often debated doing an Eclipse edition of this book or providing Eclipse versions of the student files, so we’d love to get your input. "If you’re a Java virgin like I was before reading this book, then you’re going to love it. I had a development environment up & running within half an hour and was dabbling with code 15 minutes after that!" "One of the things I really like is that this book uses NetBeans as the IDE to teach Java to the next generation of programmers. A lot of books on Java focus on the language itself. This would have the appearance that an IDE plays no role in learning Java. Any professional programmer will tell you that an IDE is absolutely essential in making you more productive. The choice of NetBeans as a tool to teach Java demonstrates its ease of use with beginners." "I bought this book to brush up on my Java programming skills in preparation for doing some Android programming. This book brought me up to speed really fast, and it even has a chapter on XML, which is used in Android." "Ever have someone come in your office with a Java question, and you reach for a certain book that you know has the answer in it? When needing assistance with the core features of Java, Murach’s Java Programming is the resource that supplies these answers, both quickly and completely. If this book isn’t on your bookshelf, you should get it there." "Another thing I like is the exercises at the end of each chapter. These exercises are a great way to reinforce the main points of each chapter and force you to get your hands dirty." "Murach’s Java Programming continues the Murach tradition of publishing only the best training books available. The style is very conducive to learning with their dual-page approach, with the left page being what a qualified instructor would be saying from the front of a classroom and on the right, the information that the instructor would be projecting on a screen. While reading the left page you can almost visualize the instructor’s laser pointer directing you to key information on the right page." "I’m reading the part of the book that discusses the nio package. The information is so clear, it beats what I read in the Java tutorials on the Oracle web site. Once again, a Murach book adds clarity that’s hard to find elsewhere." Click on any chapter title to display or hide its content. If you aren’t already familiar with the supporting courseware that we provide for a book, please go to About our Courseware. As you will see, our courseware consists of the end-of-chapter activities in the book, the files in the student download at our retail site, and the instructor’s materials. These components provide everything that other publishers provide in a way that delivers better results. If you are familiar with our courseware, here’s a quick summary of the courseware for this book. For a detailed description in PDF format, please read the Instructor’s Summary. In the book, appendix A (for Windows) and appendix B (for Mac) give your students complete instructions for downloading and installing these items on their own systems. On this page, we’ll be posting answers to the questions that come up most often about this book. So if you have any questions that you haven’t found answered here at our site, please e-mail us. Thanks! Then, if you find any other errors, please email us so we can correct them in the next printing of the book. Thank you!